EDT’s Retractable CIP Spray Nozzles are superior components designed specifically to remain in place during production in sanitary applications. The nozzle utilizes a liquid-activated spray head that extends during CIP and fully retracts after CIP flush with the inside wall of the vessel. The nozzle spray head creates a wide spray of large swirling jets that ensures complete cleaning of equipment. By using this new liquid-activated design there is no need for pneumatic air lines and connections for operation. At the end of the CIP process, the CIP supply line is simply air purged to remove any CIP solution remaining thus maintaining an even safer processing environment. The CIP spray nozzle connects to a 1” or 2” CIP supply line. EDT’s spray nozzle is USDA accepted for sanitary applications and can be completely removed from equipment for inspection. Designed with a minimum number of parts the nozzle is easy to assemble—no tools required. 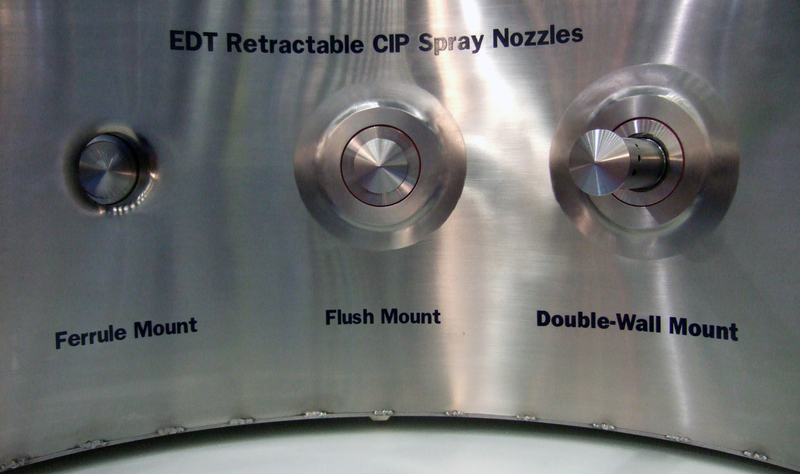 The advantages of using EDT's Retractable CIP Spray Nozzles include high-quality cleaning, increased productivity due to reduced downtime and elimination of the risks and hazards associated with manual cleaning. The CIP Spray Nozzle is available in various styles to accommodate single-wall, cladded, and cladded-insulated vessels. USDA accepted for sanitary process applications. Can be completely removed for inspection. Allows nozzle to remain in place during production without process disturbance. Liquid-activated design uses less utilities and hookups for operation. No air lines required. Reduces the risk of air line contamination. Large rotating spray range cleans hard to reach areas. Low maintenance shortens CIP time. Designed with less components than other type nozzles. Minimizes wear parts. Available with 1" or 2" liquid connection. Available for use in single-wall and double-wall (uninsulated or insulated) vessels.